It is amazing how many creative and talented people one can meet here, in this brotherhood/sisterhood of teachers. I am an English teacher in secondary school and a teacher trainer for web tools and technologies. The pictures were drawn by one of my students. 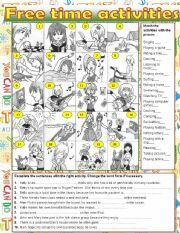 This is a traditional worksheet on matching pictures with the names of activities. There is another task where students complete the sentences with the right activity. 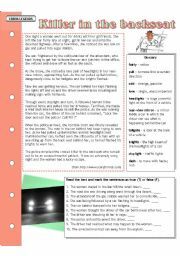 The 4th worksheet in my urban legends series. Another scary killer story with 2 tasks and a key. Sorry, I forgot to mention the site where I took the text. It is http://www.halloween-website.com. 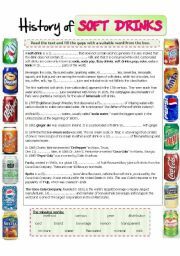 Reading w/s about the short history of soft/non-alcoholic drinks - lemonade, ginger ale, soda water, Cola, Pepsi, Fanta etc. There is a gap-fill task with answers. 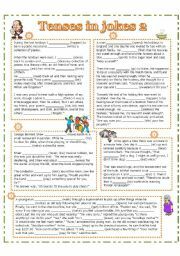 A reading-grammar worksheet. Students have to complete the jokes with the verb in the correct tense. Suitable for high elementary up to intermediate level. A fun way to revise tenses while reading jokes. Various tenses but not complicated. KEY provided. 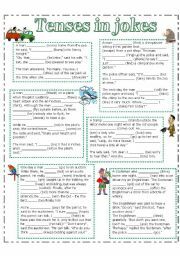 My first worksheet Tenses in jokes is also available. 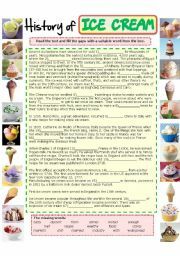 Very concise history of how the most famous dessert ICE CREAM developed and spread in the world. The text has gaps which have to be filled with the right word. While reading the text, enjoy the pictures! Reading w/s about the famous company NIKE with new vocabulary and a gap-fill task. There are pictures of the most popular athletes who advertise NIKE products. With KEY. 3rd worksheet in my Urban legends series. T/F task, with KEY. This presentation explains what a limerick is and how to write it. There are examples and tips for writing. Great fun in the classroom! Students look at the pictures and make up a story about an accident that happened on the road. Depending on students´ age, you may add more complicated words for them to use. Diamond poems or diamantes are 7-line / 16-word poems written in the shape of a diamond. They have to be written according to the pattern and they are perfect for revising the parts of speech. Suitable both for younger and older students. 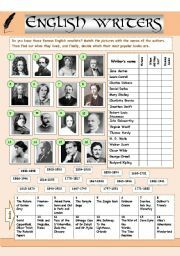 Writing mini sagas is a way to develop students´ creative skills. 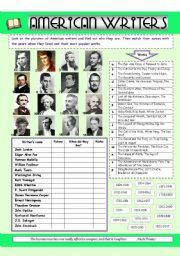 Can be used with elementary students up to advanced - there are no age restrictions. Students learn the rules, see the examples and then practice making sentences in the Reported Speech. Pictures help a lot. This presentation shows the students how an active sentence can be turned into passive. They see the examples and then make their own sentences. 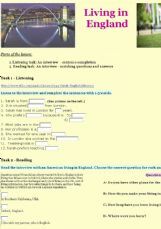 Rules, examples and practice tasks (with pictures) on reported questions. Students practice describing a painting by Marie-François Firmin-Girard En Vacance. Useful words and phrases are given. Suitable for intermediate to advanced level. Suitable for high-elementary to intermediate level. Students write a story based on the pictures. Useful words are given. The task can also be used for speaking practice. The video presents the campaign for saving rainforests started by Prince Charles. 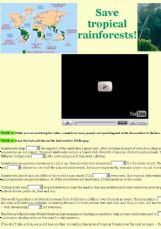 Students have to complete the task about the protection of rainforests. 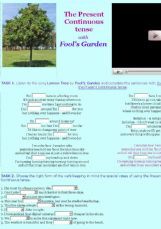 Students listen to the song Lemon Tree by Fool´s Garden and fill the gaps with the present participle they hear. There are 2 more tasks on Present Continuous tense (including special cases). For teaching cultural differences between England and Japan. I used an interview with an English woman who lives in Japan for the listening task. 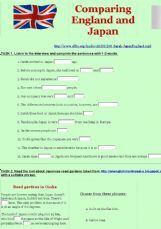 The reading task is based on the text taken from a blog of an Englishman living in Japan. Two interviews - one is listening and a gap fill task, the other is reading and matching questions with answers task - with people who describe living in England, its problems and good points. The tasks give valuable information about the way of life in England. Listening and singing task about autumn for younger kids. Pupils listen to a lovely song and write down the missing words. (The teacher can explain the most difficult words that are given there.) Then the pupils can listen to the song a second time and sing along.